There was a discussion on Linkedin’s “Luxury & Lifestyle Professionals” group which posed the question: “What is the first thing you check-out when you step into a 5 star hotel?” As you might expect, being subjective in nature, various responses were offered by the group’s participants. Some of them mentioned, the bedding, while others would state it’s the linen, the bathroom, the main lobby, overall amenities, or simply the courtesy from staff just to name a few. There didn’t seem to be an overall single consensus. It doesn’t necessarily take an expert in the hospitality domain to ascertain what constitutes the right feel of an attractive hotel – one that exploits the 5 senses to attract and retain guests (aka customers/patrons). One needs to recognize aesthetics, be discerning in his/her tastes and expectations, as well as have stayed in various hotels over time to truly appreciate what in fact matters. Savvy brands are finding ways to engage all consumer senses to strengthen the brand experience. When affluent guests choose a hotel to stay at, they desire a look and feel better than their primary residence. The hotel is no longer just a place to sleep. It has developed into a home away from home. It’s a lifestyle! The “hotel as lifestyle” creator, Ian Schrager of Studio 54 fame, has achieved international recognition for concepts that have revolutionized both the entertainment and hospitality industries. His passionate commitment to the modern lifestyle has been expressed through a series of pioneering concepts in the hospitality industry. His keen instincts for the mood and feel of popular culture were honed during the 1970s and 1980s, when he and his late business partner, Steve Rubell, created Studio 54 and Palladium. In 1984, they turned their attention to Morgans Hotel in New York and introduced the concept of “boutique hotel” to the world, and is today one the hottest segments in hospitality. Several multinational hotel chains are taking advantage of the boutique hotel trend and competition and growing their own upscale and luxury boutique collections with an international expansion. For guests, the collections present an alternative to somewhat indistinguishable properties along with rigid brand standards, whereas, the stand-alone alternative hotel properties possess a distinct personality. As a major hotel chain group, Starwood Hotels and Resorts led the way with the boutique brand in the late 1990s by launching W, which now has more than 50 properties worldwide. This brand offers a modern, sophisticated residential design with an emphasis on elegance and utmost comfort. While sharing a common aesthetic and commitment to service, each W Hotel has its own distinct personality reflecting the flavor of its particular city and neighborhood. 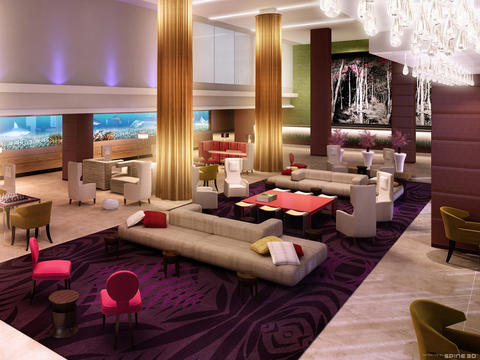 Accor, on the other hand, launched MGallery and plans for the collection to reach 100 properties by 2015. Not to be outdone, other chains such as Marriot and InterContinental have also got themselves into the boutique hotel domain not without their challenges though. Luxury names such as Giorgio Armani, Versace, Missoni and Bulgari are exploiting their cachet and design savoir-faire turning it into a lifestyle with their version of branded boutique style hotels. The first Armani hotel opened in Dubai in 2010, located in the Burj Khalifa tower, the tallest building in the world – in partnership with Emaar Properties, one of the biggest property developers in the Middle East. As in every service sector, with an upscale hotel, every customer touch-point should offer a superb experience. Hotel brands need to use an integrated approach across their various touch points to engage their customers. For example, it’s crucial that the customers have an experience that matches the perception created by the advertisement when they visit the property, or even when they place a call to the hotel reservations center. Today, the hotel industry is adapting and modifying its offer to differentiate, as well as respond to an increasingly discerning customer through innovative approaches utilizing elements of sensory marketing. During their stay, guests should be subjected to an ambiance which captures their five senses. Ambiance is identified as the decor, the service, the behavior of the staff, and how all these factors add up to create a feeling of care and enhance emotions. It’s the aesthetics, lighting, and the smell, cleanliness of the facilities, the amenities and the intangible factors that contribute to a great customer experience. This entails a combination of “sensory marketing” and “atmosphere” in action. According to the American Marketing Association (AMA), “sensory marketing” is techniques which aim to seduce the consumer by using his/her senses to influence his/her feelings and behaviors, whereas “atmosphere”, in marketing terms, is the physical characteristics of business premises such as architecture, layout, signs and displays, color, lighting, temperature, noise, and smell creating an image in the customer’s mind. Westin, who are a part of the Starwood Group, a few years ago began diffusing a signature fragrance in all of their hotel lobbies and they coupled that by standardizing the music in all the lobbies as well ─ regardless of the Westin property one visits anywhere in the world. Combining and integrating different auditory, olfactory, visual, and even tactile elements to attract, retain and seducing customers, create cozy moments of comfort along with unparalleled enjoyment. A high-end resort developer and operator, Kerzner International, renowned for its One&Only luxury resorts brand has as its core value, “Blow away the customer.” The company walks the talk by impressing its guests through grandiose entrances, facilities, overall ambiance and luxury amenities – then making absolutely certain that they are pampered throughout their stay. It’s all an integrated, well orchestrated and flattering process. Nothing is left to chance although it does take a coordinated team effort to make it all happen flawlessly. Martin Lindstrom, a brand strategist who has written six books on brands and consumer behavior, asserts that if the consumer’s senses are more involved, it further connects him/her with the brand which may create an increase in willingness to pay more. Consequently, it differentiates the brand and turns brand loyalists into brand advocates. Luxury hotel chain Four Seasons recently unveiled a new website that reportedly cost a whopping $18 million to develop. It uses a holistic digital media strategy to enhance the total online experience and give a visual taste of what can be anticipated at their properties. Extensive research around digital consumption of luxury consumers, both in the travel sector and across other categories, was conducted for the development of the new website. The result of the investment is a fancy, colorful website, with a new booking process, social media integration and personal profile technology that allows users to set preferences and create a more targeted online experience. It is also optimized for mobile, which provides access to a reduced size version of the site, and includes videos, room rates and booking capabilities. In addition, locations and experiences are showcased through photo-rich, informative property and destination pages. Emotion captured by the five senses is the key to success for a sensory marketing experience. The quality and feel of materials used all over the premises, quality of amenities, vivid color palettes widely used, the furniture design, look and atmosphere of public areas which encourage social interaction, clever use of lighting and its intensity, as well as the sounds and smell throughout should be well integrated tactile elements to attract, seduce and retain guests/customers. However, along with inviting areas, delightful service is also a crucial ingredient necessary to ensure a memorable total customer experience. The online customer encounter, along with all other touch points, also carries significance for the hospitality brands. The design-led boutique lifestyle hotel sector has evolved from a small niche to a recognized and trendy category worldwide which has also attracted the major hotel chains into the sector with stand-alone brands of their own.